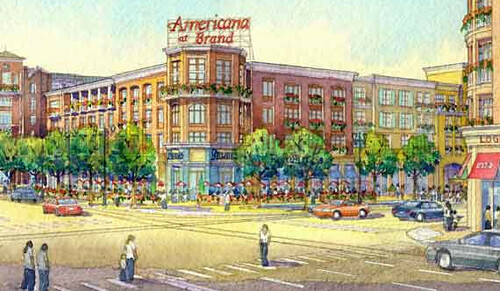 Americana at Brand, Glendale GRAND OPENING TODAY! Chandelier hangs in the middle of the street... ooh la la! Living, working and shopping all in one... another California attempt to the European lifestyle... walking in LA... with developments like this it's possible. This is one of the condominium rentals. LOVE this last pic. I could live there in a minute. I just love black & white. wow - a chandelier in the street. very interesting.